Sun., Jan. 15, 2017, 10:19 p.m.
Monique Billings scored a career-high 30 points and had 14 rebounds and six steals to lead UCLA in a 79-63 win over Oregon in Los Angeles, its 22nd straight home victory. The Bruins (13-4, 4-2 Pac 12) are tied with South Dakota for the fourth-longest active home streak behind UConn’s 57. Freshman Ruthy Hebard led Oregon (12-6, 2-4) with a career-best 29 points. 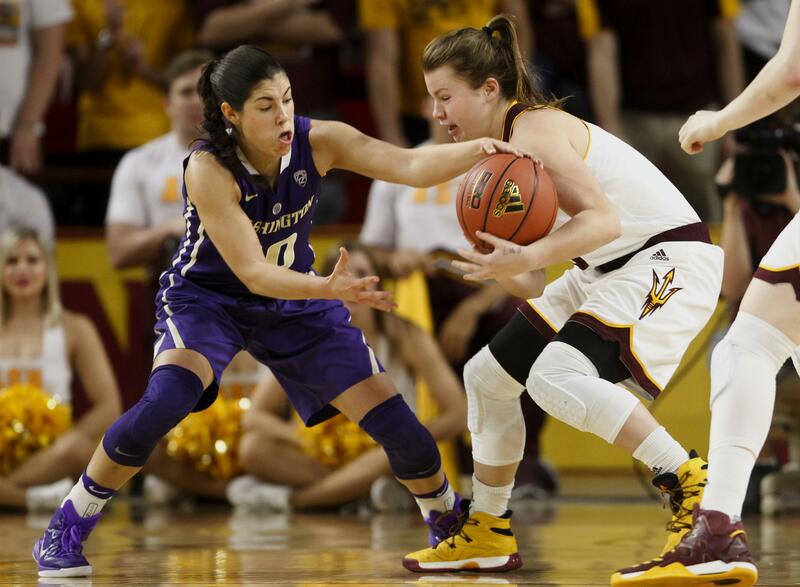 (8) Washington 65, (19) Arizona State 54: Kelsey Plum snapped out of an off shooting night to score 15 points in the fourth quarter and the Huskies (18-2, 6-1 Pac-12) pulled away to beat the Sun Devils (13-4, 4-2) in Tempe, Arizona. Plum, the nation’s leading scorer, finished with 34 to propel the Huskies to a road sweep of the Arizona schools and keep them alone in first place in the conference standings. The senior guard moved from 11th to seventh on the women’s basketball career scoring list with 3,041 points. Reili Richardson had 11 points for the Sun Devils. (10) Oregon State 74, Southern California 60: Kolbie Orum scored 16 points on 8-of-11 shooting as the Beavers (16-2, 5-1 Pac-12) beat the Trojans (10-7, 1-5) in Los Angeles. Orum also had nine rebounds for the Beavers. Maria Gulich added 11 points and 10 rebounds. Oregon State rebounded from a 66-56 loss to No. 17 UCLA on Friday night that snapped its 12-game winning streak. Sadie Edwards had 17 points for USC. (2) Baylor 92, Kansas 43: Kalani Brown scored 16 points, Nina Davis added 15 to lead Lady Bears (17-2, 6-0 Big 12) in a win over the Jayhawks (6-11, 0-6) in Lawrence, Kansas. The Lady Bears ran out to a 10-0 lead in the first four minutes and were up by 23 at halftime. Baylor had seven field goals in the third quarter to just one for Kansas. With a 38-point lead heading into the final 10 minutes, coach Kim Mulkey took out all of her starters. Jessica Washington scored 15 points for Kansas. (5) South Carolina 84, LSU 61: Alaina Coates had 24 points and 11 rebounds, and the Gamecocks (15-1, 5-0 Southeastern Conference) topped the Lady Tigers (14-4, 3-2) in Baton Rouge, Louisiana, and again overcame the absence of All-American A’ja Wilson. Allisha Gray added 21 points, and Bianca Cuevas-Moore had 17 points for South Carolina. The Gamecocks have won nine in a row. Chloe Jackson had 24 points for LSU. (7) Florida State 86, Clemson 27: Ama Degbeon scored a career-high 13 points, and the Seminoles (17-2, 5-1 Atlantic Coast Conference) beat the Tigers (11-7, 0-5) in Clemson, South Carolina, and had their biggest winning margin in 26 seasons in the conference. Kai James added 12 points to help the Seminoles beat Clemson for the 15th straight time. Kobi Thornton led the Tigers with eight points. They have lost 38 straight against ACC competition. (9) Louisville 63, (14) Miami 59: Mariya Moore scored 24 points to lead the Cardinals (16-4, 4-2 Atlantic Coast Conference) over the Hurricanes (14-4, 3-3) in Louisville, Kentucky. Briahanna Jackson added 11 points, and Myisha Hines-Allen had 10 points and 11 rebounds for the Cardinals. Adrienne Motley had 13 points for the Hurricanes. (11) Ohio State 61, Purdue 56: Stephanie Mavunga scored eight of her 11 points in the fourth quarter and the Buckeyes (15-5, 5-1 Big Ten) overcame a 16-point deficit to beat the Boilermakers (12-7, 3-2) in West Lafayette, Indiana. Kelsey Mitchell added 14 points on 3-of-17 shooting for Ohio State. Ashley Morrissette had 13 points and five assists for Purdue. (23) North Carolina State 55, (12) Duke 52: Dominique Wilson scored 16 points, Chelsea Nelson had 13 points and 10 rebounds, and the Wolfpack (14-5, 4-2 Atlantic Coast Conference) beat the Blue Devils (15-3, 3-2) in Raleigh, North Carolina. N.C. State has won three straight against Duke for the first time since 1996. Oderah Chidom and Rebecca Greenwell each scored 11 points for Duke. (13) Stanford 84, Colorado 70: Karlie Samuelson scored 20 points, Brittany McPhee added 18 and the Cardinal (15-3, 5-1 Pac-12) made nine straight shots in the third quarter to pull away from the Buffaloes (11-6, 1-5) in Boulder, California. The Cardinal trailed 42-41 and missed their first two shots of the third quarter before pulling away for a 69-60 lead. Kennedy Leonard made five 3s and scored 22 points for Colorado. (21) DePaul 85, Xavier 69: Brooke Schulte had 28 points and 11 rebounds, and the Blue Demons (16-4, 8-0 Big East) beat the Muskateers (10-8, 2-5) and won their 10th straight game to improve to 8-0 in the conference for the first time. Jacqui Grant added 17 points, 13 rebounds, five assists and four blocks for the Blue Demons. Raeshaun Gaffney led Xavier with 22 points. Utah 63, (24) California 57: Malia Nawahine and Emily Potter each scored 15 points as the Utes (13-4, 2-4 Pac-12) knocked off the Golden Bears (14-4, 2-4) in Salt Lake City. The Utes never trailed, slowly building the lead to 12 points on a layup by Nawahine with 4:30 to play. Kristine Anigwe led Cal with 22 points, 10 rebounds and a career-high seven blocks. Published: Jan. 15, 2017, 10:19 p.m.